Federation Personnel of Android species. While this personnel is facing a dilemma, he is Integrity +2 and gains Honor. "I aspire, sir. To be better than I am." 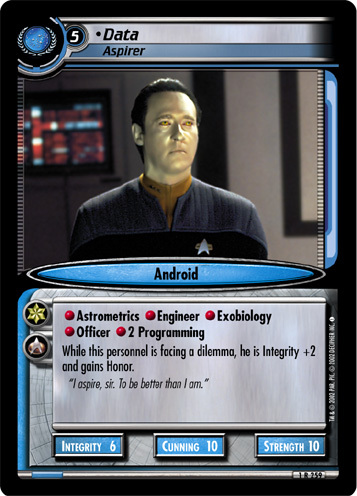 Characteristics: affiliation, enhance your INTEGRITY (this card), Next Generation related, personnel who has a cost of 3 or more, personnel who has a cost of 4 or more, personnel who has a cost of 5 or more, Android "species". There are 20 entries for Data, Aspirer (ST2E 1 R 259) at the Tradeplace (17 haves and 11 wants). Click here to see all trade list entries for this Rare card! Also see here for all trade lists with any card fom "Second Edition".